Sue Baic is an experienced public speaker with a true passion for her subject area of nutrition and health. She is noted for her lively, interactive, accessible and entertaining lecture style which often brings the outside world of local food and nutrition on board. 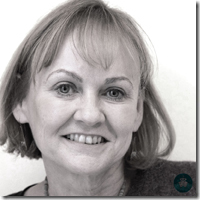 Sue is a registered nutritionist and dietician based in the UK. She is passionate and knowledgeable about her subject and has over 25 years� experience in researching and public speaking on the links between nutrition, health and well-being. Sue has worked in the health service, private clinics and at the University of Bristol as a Senior Lecturer. She is a co-author of three popular nutrition books including Nutrition for Dummies. In January 2017 Sue started work as a guest speaker on board cruise ships has given 50 talks over 13 cruises to date. Sue can contribute to an enrichment programme which may enhance the experience of passengers. Nutrition is a fascinating and enjoyable topic with broad appeal which fits with large numbers of passengers interested in health, wellness and positive ageing. Sue has a wealth of experience about dietary patterns around the world and the links with health. She is happy to create a customised lecture series tailored for specific itineraries and audiences. Sue works as freelance nutrition consultant in the UK and so is flexible and available for lecture appointments including some at short notice. �Your talks were really informative and it was interesting to hear that you don't need to spend loads of money on so-called superfoods, but can get the same benefit elsewhere�. S.R. �I enjoyed your on board talks and hopefully can incorporate all the good advice in our daily diet! The whole area is so difficult to manage and I am grateful for the web sites info you suggested�. M.M. �I enjoyed your talks very much and you deliver them with so much enthusiasm. I hope your talks go some way to help people make those lifestyle choices. Thank you so much. It was lovely to meet you�. E.C. �I found all your talks interesting and informative and they appealed to my personal way of life�. P. L.
�Your lectures were most inspiring, so much so that we are planning to incorporate your advice into our regular diet with the goal of prolonging our active life into old age!� G.C. "My friend and I really enjoyed your lectures. I was particularly interested in food/mood and your fact sheets are very helpful and informative" K.A. �I really enjoyed your lectures - very helpful and informative without being "preachy". I learned some interesting information from you. Hope to meet you on a future cruise� K.J. �We both really enjoyed your talks. They were very interesting and gave us food for thought (in more ways than one)!� A.W. �We found your talks fascinating and picked up a lot of good advice� C.M. �I have spent many years cruising and come across lots of different speakers and I felt your talks were interesting, enjoyable and easy to follow. Thank you, happy cruising�. P.G. �I appreciate you taking the time to send me the links to the fact sheets. It was a pleasure to meet you on the cruise and attend your lectures, which I found really interesting and very informative. You clarified many aspects of nutrition and diet which I was quite confused about� C.F. Background to Lecture Series : Hot Topics in Nutrition - Food for Thought? It�s becoming clear that there is much we can do to stay healthy, especially as we get older. However dietary information can be confusing � one minute you�re told to have blueberries and the next it�s green tea ! What�s the truth? This entertaining and informative series of talks sorts fact from fiction,navigate the tricky world of nutrition science and translates recent research into positive practical strategies to take home. Sue is an expert Dietitian and Nutritionist and co- author of bestselling Nutrition for Dummies with over 30 years� experience in the NHS and Bristol University. She is here to help guide us through this minefield. The talks are flexibly tailored to cruise itinerary using local foods and dietary patterns to bring the outside world of shore excursions alive on-board. All talks are 45 minutes followed by Q & A. They are fun, interactive and visually illustrated using PowerPoint. 1. Mood Food - give me chocolate and wine and I'll be fine! We all have good & bad days, especially during in the shorter,darker days when it�s autumn and winter at home, but is there anything we can do to influence this? Recent studies have shown that what we eat and drink can influence mood, energy levels, concentration, even how we deal with stress. This enjoyable session explores the latest scientific research and highlights some smart mood boosting steps we can all take. 2. Avoiding weight gain on a cruise:little things can make a big difference. 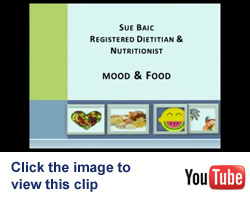 In this light hearted but informative session Sue Baic, expert Dietitian and Nutritionist and co- author of bestselling Nutrition for Dummies, offers some positive, practical strategies from the fields of nutrition and psychology which can help avoid weight gain on board without depriving yourself! Please note: This talk is developed as a response to passenger feedback saying there is confusion about the topic and a desire to avoid weight gain on board. It uses research studies alongside top tips from passengers themselves. It can be customised to location and season e.g. maintaining a healthy weight without foregoing the festive season e.g. during a Christmas/ Thanksgiving cruise. 3. Nutrition for positive ageing : can we eat ourselves younger? Research shows it�s never too late to future proof your health. It appears genes only account for a small part of our lifespan and what we eat and drink can make a big difference to quality of life and health - helping us to age well. A healthy diet benefits areas from our brains to our bones to our eyes. This session takes a look at the reality behind diet for positive ageing and helps translate the science into realistic practical tips. Please note: This talk will be tailored to cruise location to bring the outside world alive on-board covering destinations where people live long and healthy lives including Central America,the Mediterranean, the Caribbean, Scandinavia or Asia showing how to take the best from local dietary patterns. 4. Superfoods for health : do they really exist? In this practical session we look at the latest research on how certain foods can help promote good health and highlight some smart choices we can all make bringing the outside world alive on-board. Please note: This talk will be tailored to cruise location showing how to take the best from local dietary patterns. Recent studies have suggested the Nordic diet has impressive health benefits helping protect against heart disease, stroke, diabetes as well as some cancers and promoting positive ageing. But what�s the reality behind this research and how can the diet inspire us with ideas we can use no matter where we live? Please note: This talk is tailored to cruise location when visiting Norway, Sweden, Finland, Denmark or Iceland showing how to take the best from local dietary patterns. Recent studies have suggested the Mediterranean diet has impressive health benefits helping protect against heart disease, stroke, diabetes as well as some cancers and promoting positive ageing. But what�s the reality behind this research and how can the diet inspire us with ideas we can use no matter where we live? 7. Thinking of eating less meat? Plant based eating has hit the headlines recently as a win- win approach for health, the environment and animal welfare. If you or your family and friends are thinking about shifting towards a more flexitarian (occasional meat & fish), vegetarian or even vegan way of eating this session can help you do so effectively, safely and enjoyably without missing out on key nutrients. 8. Eating for an active lifestyle? Activity boosts both our physical and our mental health. This fun, informative and practical session explores recent research on how food and drink can enhance our enjoyment, performance & recovery from sport, exercise and physical activity- whatever we choose to do. 9. Are you getting your five a day? The message to aim for 5 a day fruit and vegetables is well known but what does it really mean and why does it matter? Which types count towards this goal and what's a portion? Is 5 really enough or should it be more? This fun session looks at the scientific background behind this message and helps translate it into practical, affordable and palatable tips. 10. Myths and misunderstandings in nutrition - does healthy eating really need to be so boring? Dietary information can be confusing � one minute it�s blueberries and the next it�s green tea! How do we get at the truth? If there�s something you�ve always wanted to know about diet - now�s your chance. Sue Baic, expert Dietitian and Nutritionist and co- author of bestselling Nutrition for Dummies, guides us through this minefield, clearing up areas of misunderstanding, answering your questions and highlighting enjoyable healthy choices. Soy, fermented foods, sushi and green tea as well as other key foods play an important role in countries of the Far East but are becoming increasingly popular in other areas around the world. This session examines the role of these foods in promoting health and longevity and uncovers how we can enjoyably include them in our diet no matter where we live. The distinctive diet of the Caribbean conjures up images of brightly coloured foods which pack a healthy punch. Sue Baic, expert Dietitian and Nutritionist and co- author of bestselling Nutrition for Dummies, brings the outside world alive on board exploring what we can take from traditional local superfoods on our cruise to get the health benefits no matter where we live. 14. Eating for a healthy heart: how can diet make a difference? Research shows that the risks of heart disease, stroke, high blood pressure and type 2 diabetes can all be reduced by a heart healthy diet.This session takes a wide ranging review of the latest scientific evidence for dietary factors which can help and translates this into useful positive and practical tips to take home. 15. Popping nutritional pills and potions: are supplements as effective as food? Nutritional supplements, such as multivitamins and fish oils, are big business with around one in three of us taking something every day. But can they replace the need for a healthy diet? Surveys show many of us struggle to know whether they are safe or effective and in what form or dose to take them. This talk explores which dietary supplements might be useful and whether any may be best avoided. Carbohydrates seem to cause more confusion than any other nutrient. Are they good or bad for health? Which types are best to eat ?This session covers the most recent research and recommendations on carbohydrates and health, helps clear up the confusion and explains why some types are better than others. Overeating is a real risk in society today but how do we know what makes a suitable portion size? This session takes a tour through the main food groups exploring recent research on how much of each we should eat for optimal health. This session explores what food allergy really is and how to tell if you have one. It explains how to cut out allergenic foods without missing out on key nutrients and how best to cope when travelling with a food allergy. 19. Top 10 tips for great nutrition: how does your diet measure up? Research shows that many people feel their diet is healthy but most food surveys show a different picture. This fact packed session, based on the latest research, allows you to rate your own diet helping pinpoint some surprising areas where you may be able to improve it. Sue has full travel insurance as a Cruise Ship speaker. "Sue is an experienced dietitian with a passion for communication. She combines robust nutritional science with sound practical advice, making healthy eating options understandable, enjoyable and achievable. "Alice Roberts, Professor of Public Engagement in Science, University of Birmingham. "Sue is a much-valued official spokesperson for the British Dietetic Association representing us on countless occasions through various media channels such as national newspapers, television, radio and magazines." Steven Jenkins, PR Officer, The British Dietetic Association. "Sue is the lady I rely on when diet-related presentations are required. They are always brilliant. She has the skill of being lively, engaging but realistic." Jan Procter-King, Editor In Chief, British Journal of Primary Care Nursing. "Sue is highly knowledgeable in her field and a great enthusiast. This comes over very strongly in her teaching sessions which are always excellently presented, entertaining and appropriately tailored to the learning needs of her different audiences. It is always a pleasure to attend her lectures. I always leave feeling informed and inspired." Dr Rosie Heath, GP Wsi Cardiology Lead for NHS Plymouth. "Sue is a highly professional individual who is full of enthusiasm for her speciality. She always goes that extra mile and indeed makes every project better because of her involvement." Liz Fox Senior Health Promotion Specialist, Bristol Directorate for Public Health.